June 18, 2013 6 comments on "How to Make Beef Gravy Mix"
I recently tried making my own chicken gravy mix, and it was so good that I decided to make beef gravy mix too. At our house we definitely eat more chicken gravy than beef gravy, but beef gravy goes great over cubed steak with a side of mashed potatoes! Note: When you are shopping for beef boullion, make sure to check your labels. By making your own mix, one of the things you are trying to get away from is the MSG that is added to gravy packets. If you look at the jars of beef boullion, you will find that many of those also contain MSG. This is my favorite beef boullion mix. It is gluten free and MSG free. Mix all ingredients together and store in a quart sized canning jar or other airtight container. To make the gravy, add 1/4 c. mix with 1 cup milk or water. If you stir it in really well with a whisk you won’t get any lumps in your gravy. 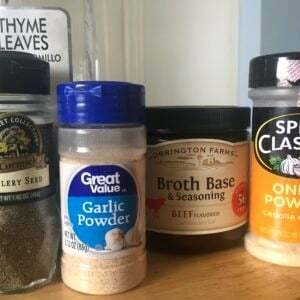 6 Comments on "How to Make Beef Gravy Mix"
I checked the ingredients of your favorite beef bouillon. It contains yeast extract, which is another name for MSG. Yeast extract does contain naturally occurring glutamates, but not as much as MSG. Here is more information about yeast extract for anyone who is interested. What gluten free flour would be best to use? I use Bob’s Red Mill 1-to-1 Baking Mix to make gravy all the time, so I think it would probably work for this, also.